No, it’s not a conspiracy theory anymore. A US company has just thrown a party celebrating the microchipping of 50% of its employees. This marketing gimmick is meant to normalize microchipping of all citizens on the planet, for easier surveillance monitoring and societal control. 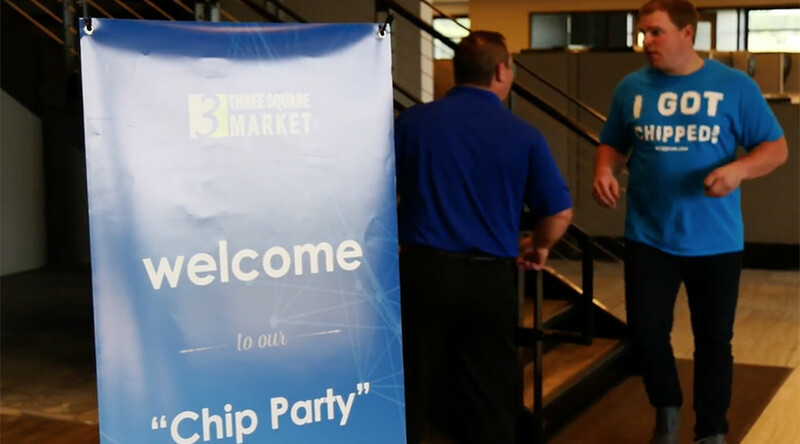 A Wisconsin company has implanted microchips into its employees at a symbolic ‘chip party’, a first for the US. Now the ‘chipped’ employees can open doors, login to computers, use copy machines and even buy chocolate bars with a wave of their hands. Three Square Market used this ‘upgrading’ technology on its employees on Tuesday. The procedure, which included implanting a Radio-Frequency Identification (RFID) microchip between the thumb and forefinger underneath the skin, was voluntary. At least 41 of the 85 employees received the devices, at the company’s HQ in the city of River Falls, AP cited the group. “I think it can control everything. I gave an example earlier, [that] when you get pulled over, you just stick out your hand and he’ll [a police officer, asking for license and registration, for example] scan your hand. You don’t have to carry anything,” software engineer Sam Bangston told Ruptly. The microchip doesn’t use GPS and thus can’t be used to track the employees, the company says. The data on the device is encrypted, like the technology used in credit card. “Obviously this drew a lot of attention and a lot of feedback of ‘Oh, they’re going to be tracking you down the road.’ They can’t, there is no GPS added in this and there can’t be in this particular chip,” Melissa Timmons from the sales department added. The technology allows the company’s employees to make purchases in the company’s break room, open doors, login to computers and even use copy machines. The chip works like a proximity card. Vice President of International Development Tony Dannon immediately demonstrated the technology – he managed to buy a chocolate bar with his newly-implanted microchip. “Like we had heard it’s about two seconds from the time the needle goes in to the time the needle is removed and the chip’s in there,” Dannon later told Ruptly. He, like the majority of the employees at the ‘party’, was wearing a T-shirt with a symbolic slogan ‘I got chipped’. Though the technology is new in the US, a number of European companies are already using these microchips. According to President and CEO of Three Square Market Patrick McMullen, the company needed such a measure. “There are governments that run central banks they were one of the first ones to call us to say we’ve got to control our employees and we need to have certain access levels and we can’t have that compromise, and they saw that as a solution,” he said. US Food and Drug Administration (FDA) approved the use of these microchips back in 2004, the company said, adding that the device is “similar to a splinter” and can be easily removed. There’s no GPS? So, it won’t be used for surveillance? Are you dumb? Or, are you assuming that people are? Anything that communicates wirelessly with anything is a tool for surveillance. I cannot understand these people who allowed this procedure and these chips. I cannot believe they are so dumb,but possible they would lose the job if not, one thing for sure The people at the top of this business will not have the chip implanted in their bodies. I’d resign immediately if i work for a company like that. Refuse to become scapegoats of politicians. Tell them you have better work to do. Be a free man, and think for yourself. Proceed only as far as your own talents and experience can take you. Examine everything, and believe only what appeals to you as correct.